Crowdsource ’64 to 2250′ walkable density? It’s been well documented recently that suburbia is on the decline, and artists have been scooping up foreclosed homes in such neighborhoods, as covered in the Wall Street Journal’s Artists vs Blight. The good news is that progressive crowds are finally able to afford a home. The bad news is that they’re in neighborhoods that are anything but progressive, and in fact creatively and economically isolated. What to do? How about recycling the old and crowdsourcing a new neighborhood, by and for creatives? 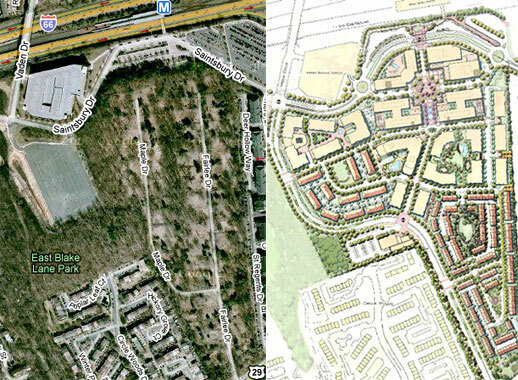 While it wasn’t crowdsourced, a group of 64 home owners sold their homes to allow 2250 new residences to replace them in Vienna, Virginia, at a station that’s part of Washington DC’s light rail/subway network – see When 2250 homes replace 64â€¦. That’s the equivalent of providing 35 homes instead of one while simultaneously providing more of what people really wanted in the first place. It will take a real estate developer that’s willing to share the profits with the home owners, and a community of home owners that collectively represent a sizable site (like the 60-acre aforementioned neighborhood) that are willing to give up ownership of a single-family home in a dying neighborhood in exchange for a significant profit and an opportunity to live in a much more vibrant walkable-density neighborhood. Now that’s truly recycling suburbia, as Time Magazine states is one of the 10 Ideas Changing the World Right Now.